Adults and youth from 15 years on. Ski touring combines two basic sports of the mountains: Skiing and alpinism. 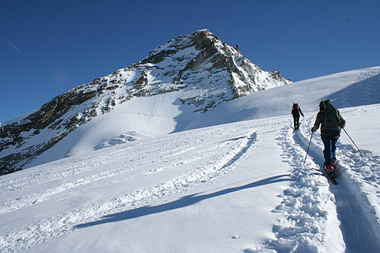 It is widely considered as one of the most complete and rewarding sports, which can be done in the mountains in winter. The ski tourer aims for reaching a summit or col using the skies as far as the terrain allows. Ski touring in the high mountains with its severe ambience of altitude and imperious terrain demands a profound knowledge of the winter conditions in the mountains (snow conditions, timing, etc.) the possession of adequate equipment (Ski, Ice tool, crampons, skins etc. ), a good offpiste technique, a good technique moving on rock and ice ( only for the tours, which provide this) and last but not least a specific training in consideration of the endurance required mastering high elevation differences. The best month for ski touring in the high mountains, with the possibility to accomplish also traverses or several day journeys with overnight stays in bivouacs or huts, are those in spring, when the snow is transformed and present itself in best conditions. It is necessary to possess the ability to ski safely on level “red” pistes. Before committing to any kind of ski tours we recommend to gather some experience on off piste terrain to get familiar with powder snow. Due to the nature of this activity, there is a risk of getting caught in an avalanche involved. The ski tourer can indeed overload the snow loaded slopes with his weight, “cutting” the slope and this way loosening the cohesion of the snowpack. This can provoke the detachment of an avalanche. To prevent this eventuality ski tourers need to analyze carefully every slope, valuate inclinations, expositions and snow conditions at this particular moment to be able to evaluate the possible risk of a detachment. In case of an avalanche it is necessary to use an ARTVA (Appareil de Récherche Victime d’Avalanche), but also shovel and probe, for a precise and fast localization of the victims and their rapid recovery. The use of skins (in the early stages natural ones, later displaced by synthetic products), attached at the base of the ski to allow advancement and hold on the ascend, has been picked up again by the pioneers of ski touring from the explorers of the polar area. The years after the second world war has brought a notably evolution in techniques and materials (1927 signifies the first Italian ski ascend of the Monte Bianco by Ottorino Mezzalama and Ettore Santi). Already in 1933 the first edition of the Trofea Mezzalama was organized, one of the most important competitions in ski touring as a competitive discipline. On the summit of Gran Paradiso! We offer a fantastic adventure at high altitude! Discover with us the Gran Paradiso. With our Alpine Guides you will discover this fantastic mountain safetly. We have updated our photo gallery. Click here to see new images. Hiking, trekking, climbing, canyoning ... and more!